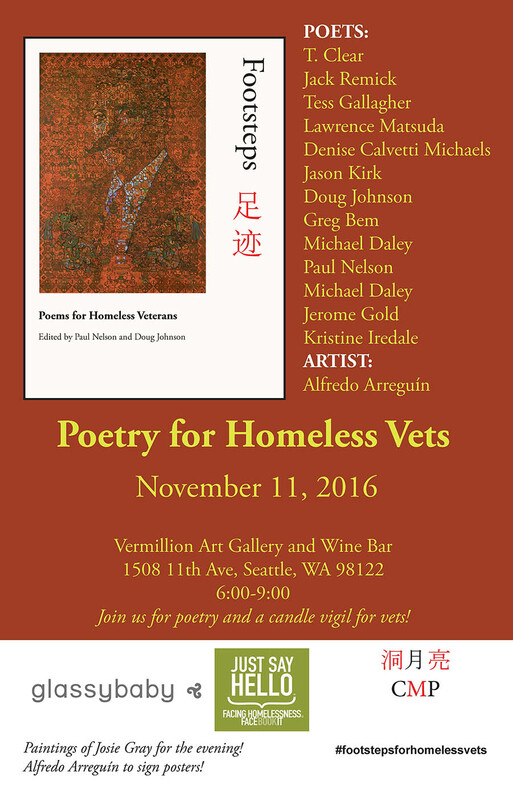 I am very excited to be involved with this upcoming poetry event that is themed around and in respect for homeless veterans. Thanks for your interest in our Veteran’s Day event! Come join us at the Vermillion Wine Bar and Art Gallery for a candle vigil and poetry reading! Celebrated poets from all over our region will read. We will also have the chance to purchase candles from glassybaby, Seattle’s premier hand blown glass candle company, Candle and book sales directly benefit Facing Homelessness. We start with candles and the wine bar at 6. We read poems at 7 and then we walk to Cal Anderson park with our lit candles at 9 where one last poet will read. Tag the Facing Homelessness Facebook page and share with as many people as you can. I’m personally/particularly looking forward to hearing the many amazing voices who will be participating in the reading, as well as getting the opportunity to speak with homeless vets who may find their way to this event. Or vets in general. Or homeless in general. Though I find most of my writing to be rooted in or an output of incredibly complex social systems and social issues, I’m rarely directly confronting specific instances of these systems and issues. My own contribution to the reading will hopefully be mindful and offering a source of strength and healing, which I believe poetry should consistently strive to provide regardless of the setting. Posted in My Poetry, Others Poetry, Past Events. Bookmark the permalink.